Russia has a patchwork of laws that apply to the digital economy and cloud computing, and these laws contain significant gaps and limitations. For example, its laws on both privacy and cybercrime do not follow recognized international standards. Russia requires personal data of Russian citizens to be stored on servers based in Russia. This requirement has a significant negative effect on the digital economy. In addition, any personal data information system (even a simple database) must be certified by the Federal Service for Technical and Export Control (FSTEC). Furthermore, only hardware and software that has been approved by the FSTEC and the Federal Security Service (FSB) can be used for personal data processing in Russia. Russia allows certain flexibility regarding whether local or international standards should be used but no preference is given to international standards. Russia also has cumbersome Internet filtering and censorship regulations that act as a barrier to cloud computing. Russia mandates the use of certain products and software in government procurement opportunities. Russian law addresses copyright infringement liability, as well as “safe harbors” from such liability for intermediaries, including cloud service providers, that comply with relevant requirements. However, Russia has a poor record of intellectual property enforcement in general, and laws protecting against circumvention of technological protection measures are limited and poorly enforced. Overall, Russia’s place in the Scorecard rankings fell sharply in 2018. The negative effect of the data localization regulations and lack of promotion of free trade contributed to the country’s ranking falling by four spots — from 17th to 21st. 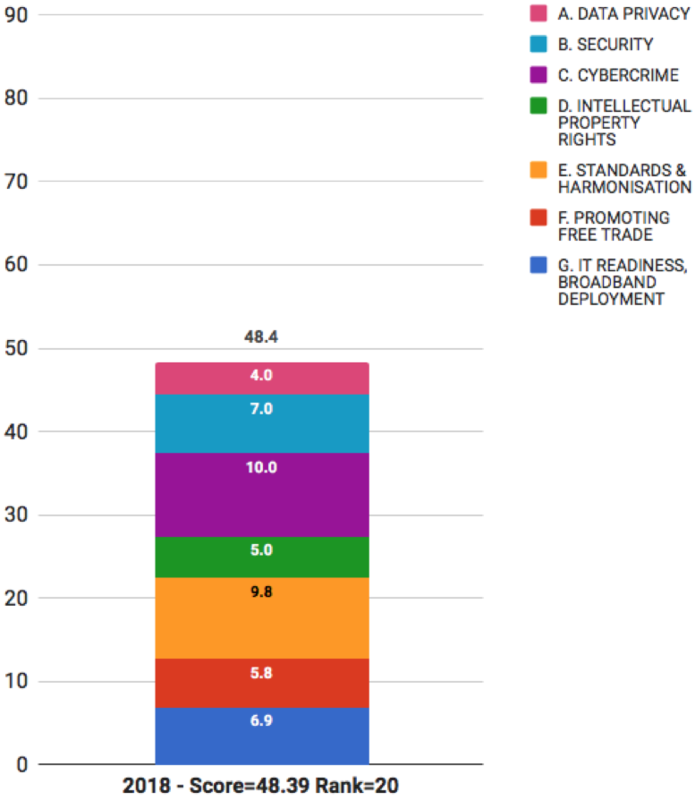 - 11th for IT readiness and broadband deployment.